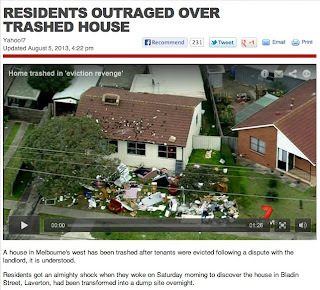 'Residents Outraged over Trashed House', was a headline article online last Monday that caught my eye. A house in Melbourne's west has allegedly been trashed by tenants who were evicted following a dispute with their landlord. The photos resemble a dump site, including a sofa mounted on the roof, an ironing board hanging from the front tree and rubbish strewn everywhere. The article states this appears to be an appalling act of revenge and has sparked shock throughout the community. As a landlord myself, this issue is a huge concern. Damage to property is a big risk owners face. So why be a landlord, why take these risks? As landlords there are things you can do to minimise your risk. In the first instance these include landlord insurance (in my view, a must) and selecting the right tenant for your home. Once under way with your chosen tenant, regular inspections need to be conducted and any warning signs should be flagged early. To my way of thinking, it is clear attracting the right tenant is critical. Significant background research and not being too quick to take the first application has saved Toop&Toop's clients a lot of issues. Having 'Leasing Specialists' works better than generalist agents who try to be a jack of all trades, like Genevieve referred to two weeks ago. Then once the right tenant is found and vetted, it's doubled checked by our specialist Property Management Team. By creating a two-step process of approval you have the benefit of rigorous discussion to ensure the best applicant is chosen. Taking off my landlord hat, I have also experienced life as a tenant for seven years on the Gold Coast and in Sydney. This gave me a terrific insight into how much life is impacted by the quality of your leasing agent. For example, our requests for a working TV cable and a repaired blind in my bedroom to me seemed very reasonable, but fell on deaf ears. As tenants, we believed it would be simple to fix, but was turned into a massive stand off. It really impacted on our feelings toward our life in the home. Having now been both a tenant and landlord, I can see the role of the agent is critical. As agents we understand there are two different views of the world that must be weighed up. Leasing agents should have an empathetic team working behind them who understand both points of view, but ultimately are working in the interests of the landlord. This will create an environment where the landlord comes out as the winner. The tenant will invariably care more for the property and be happy to accept more responsibility, minimising the landlord's risk. Of course as agents we cannot always get it right…human nature can surprise the best of us. However, if your property is well managed, with empathy, you will have better tenants, paying more rent for longer…minimising risk. A win-win situation.